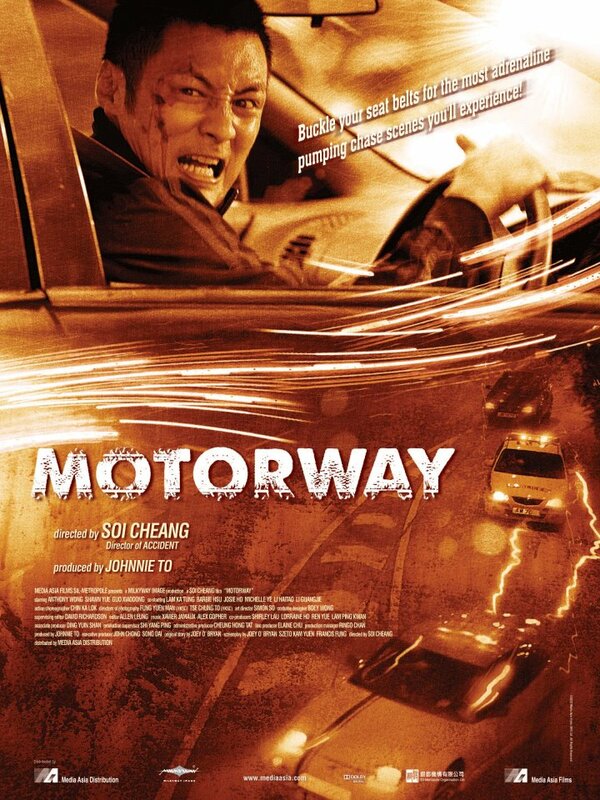 Motorway, Soi Cheang's second film for Milkyway Image (after Accident) took three years from the start of production to it's release. Dogged by delays with script alterations and editing problems, along with breaks for filming Cheung's big budget Monkey King movie, was Motorway ultimately worth the long wait? 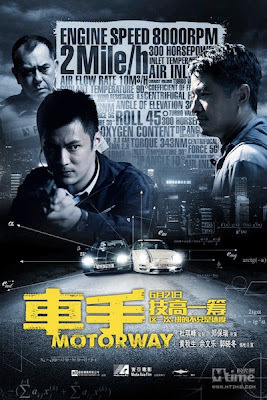 Cheung (Shawn Yue), is a traffic cop and part of the pursuit team whose job is to chase down and stop dangerous drivers, he also moonlights as a racer in Hong Kong's illegal street racing scene. He lives to drive fast and struggles with authority, thus upsetting his soon to retire partner Lo Fung (Anthony Wong), who is keen to stay out of the trouble the hotheaded rookie gets him into. 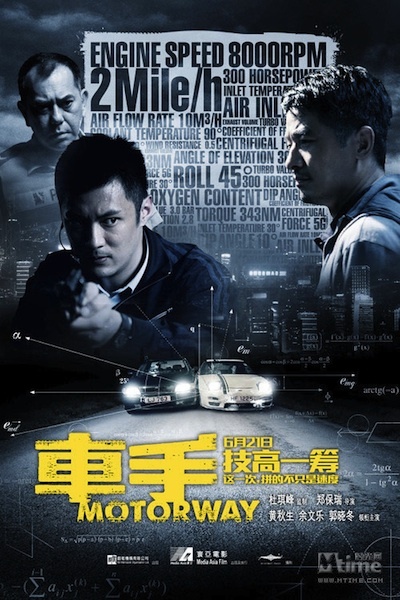 When Jiang (Guo Xiaodong), a highly skilled wheelman from Lo Fung's past returns to Hong Kong to free criminal Huang (Li Haitao) from jail, the four men are on an inevitable high speed collision course. 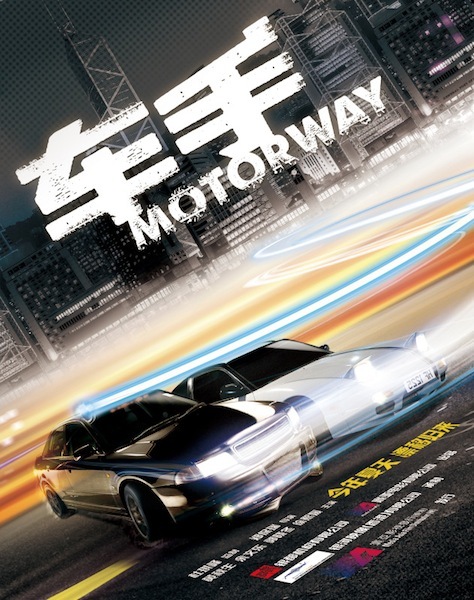 Originally billed on the teaser posters as "A karate showdown on wheels", the finished film delivers something as close to that description as anything you could imagine, with the master and pupil style relationship between Wong and Yue's characters, the learning of a particular driving "stance" and also in the duel like nature of the driving sequences, where skills and technique are more important than speed or power. Like many kung fu movies Cheang's film is extremely simple (not to mention cliched) in both it's narrative and characterisations, and it isn't hard to see why the movie has received criticism for this exact reason. However what could be considered a weakness is in my mind one of it's greatest strengths. Although clearly taking influences from a number of car movies, it's difficult to discuss Motorway without mentioning Refn's Drive. Despite production beginning on Motorway long before Drive, it's clear Refn's film was a huge influence on Cheang's movie (although he claims not to have seen it), mostly obviously in it's aesthetics and the emphasis on mood, but also in being an exercise in pure genre filmmaking. While Motorway doesn't quite reach the heights of Drive in this regard, the decision to jettison back story and subplots from the film in the editing process and maintain a lean almost 90 minute running time pays dividends. Leaving little fat behind, it rewarded this viewer at least with a taut and satisfyingly simple cops and robbers tale that benefits from having the confidence to get from A to B without the need for silly plot twists every five minutes, as so many films do these days. In a nice touch, almost all the nuances of character and psychology are added when the characters are in their cars, and via their driving styles and choices, thus helping to keep the film tight as a drum, only the underdeveloped female roles feel a little extraneous. Slick and stylish, technically the film is excellent in every department, with the almost exclusively real car stunts generating genuine excitement as the photography perfectly catches the neon lights of night time Hong Kong flashing by, and the growl of the engines and screeching of burning rubber highlight the film's terrific sound design. The electronic score by Alex Gopher and Xavier Jamaux (available as a download from itunes and Amazon) is superb, as is occasionally, a highly effective use of silence. The leads are all solid with the ever dependable Wong stealing the show as usual, although Guo Xiaodong does plenty with not a whole lot to work with, at least on paper. 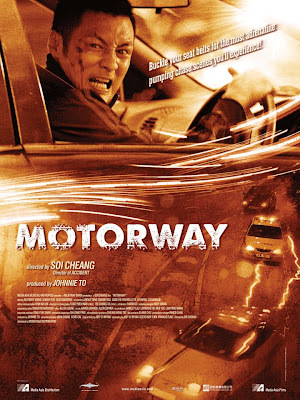 The slickness of Motorway may alienate fans of the director's earlier works, in particular it's a world away from the nihilism of Dog Bite Dog, and as much as I enjoyed both this film and Accident I really hope the edginess of Cheang's earlier work hasn't disappeared completely. The fact that Motorway revels in it's simplicity and uses so many genre and character tropes, results in the fates of the four main characters being completely obvious from a very early stage of the film. If this is an issue for you then you will undoubtedly have problems with Soi Cheang's movie, if however you are more interested in the journey than the destination, then put on your seatbelt, hold tight and enjoy an exciting ride around the high speed streets of Hong Kong! Viewed via the Hong Kong blu ray. First up apologies for not being around for so long, I hope to be back to normal very soon and back to posting at least semi-regularly, but that's enough about me, it's time to get back to some Hong Kong cinema goodness. 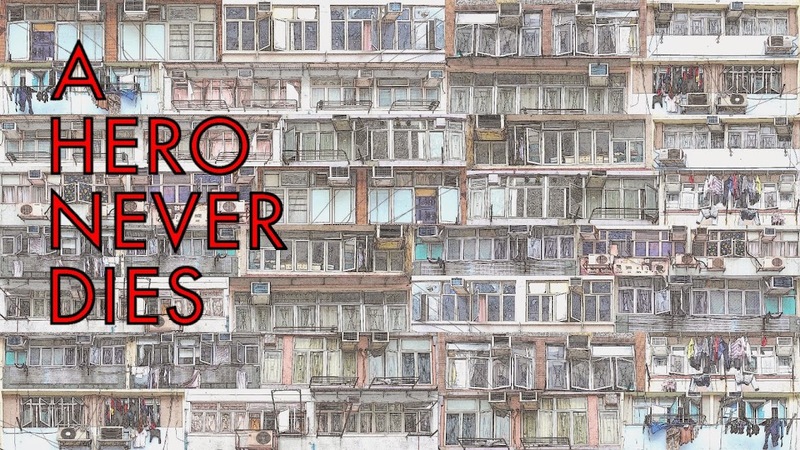 While I've been away Kozo over at LoveHKFilm.com has been posting the results of his poll to find the best Hong Kong films ever, and the results were not only very interesting but also superbly entertaining thanks to Kozo's familiar style of commentary. Now I imagine anyone reading this would have not only seen the results but would have also contributed to the poll so this post maybe a little redundant, but just in case any of you missed it here are the links to each section of the list, enjoy! In addition to the best films, you could also vote for the best performances in Hong Kong film and here are the links to that poll. I have two confessions to make, first I was the one who voted for Tony Leung Ka Fai in Men Suddenly In Black and I stand by that decision, it's a performance of comic genius. 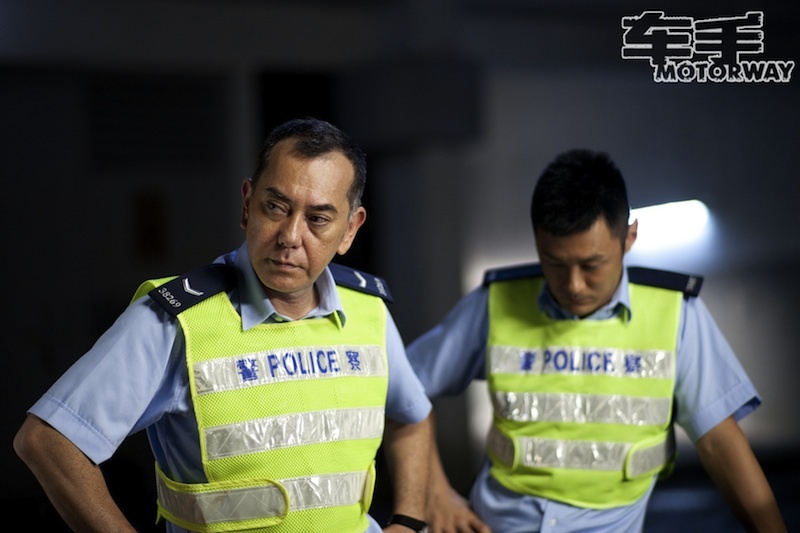 Secondly I completely forgot about Anthony Wong in Beast Cops, so please add one vote to his score. I'd like to thank Kozo for all the work and effort he has put into this vote, it's hugely appreciated by me and I'm sure all the other HK cinema fans out there.